I recently did a Staedtler, Stabilo, Sharpie, and Bic Marker Comparison. 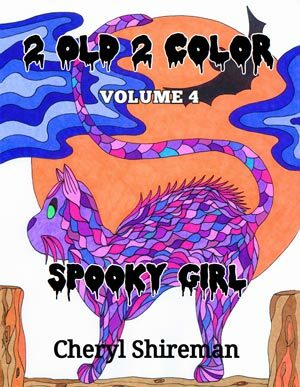 When it comes to adult coloring books, enthusiasts generally fall into two categories – those who enjoy the coloring books with lots of tiny detail and those who enjoy coloring images that are less complex. I tend to fall into the latter. 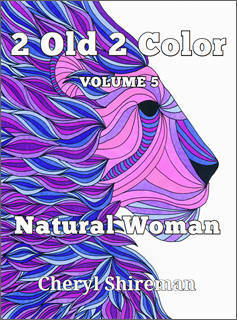 I color to relax and coloring extremely intricate patterns is not my idea of relaxation, but to each his own. One of the very most popular adult coloring books is Secret Garden by Johanna Basford and it is full of very detailed images. 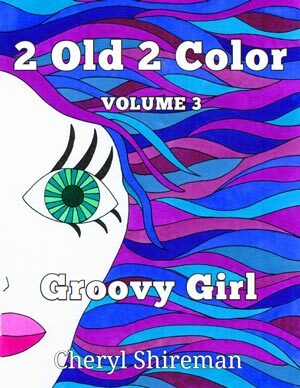 To color in such a book, you need to use either coloring pencils or markers with a very fine point. This review will focus on the latter – four markers with very small points. 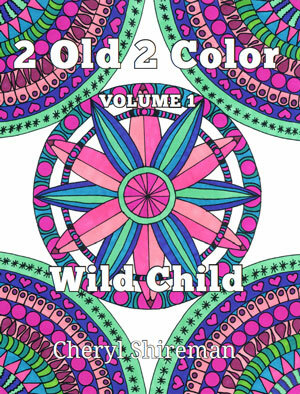 To make the comparison, I selected a page from 2 Old 2 Color: Wild Child (Volume 1 of the 2 Old 2 Color series). 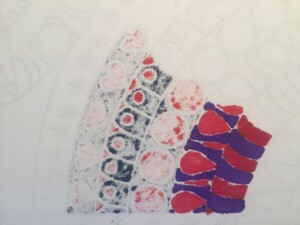 I colored a section from one of the pages using each of the markers and chose purple and red for each section I colored. Starting at the top of the image, I used Sharpie Stylo Pens, Staedtler Triplus Fineliners, Stabilo Fineliners, Sharpie Ultra Fines, and Bic MarkIt Ultra Fine markers. 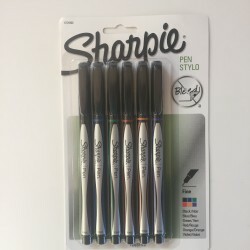 Sharpie Stylo Pens can be found on Amazon in a pack of 12 colors. I bought multiple smaller packs because I could not find the larger 12 pack where I live (and I wanted to finish this review today!). I was really excited to try these Sharpie Stylo pens out because I love Sharpies and was excited about the possibility of a new coloring tool! I expected the Sharpie Stylo Pens to have strong color that covered the page nicely (like other Sharpie products). I have to say, I was disappointed. As careful inspection of the image to the left will show, the coverage was uneven and blotchy. I could go back and color over light areas, but I still felt the color was never distributed evenly. 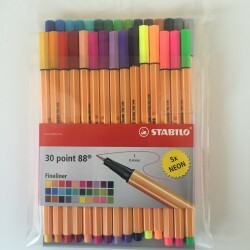 Stabilo Fineliners with 0.4 mm points are also available on Amazons in a nice sized package of 30 colors that include 5 neon colors. While these are very well reviewed on Amazon, I have to say I was disappointed with the quality of these pens. They are available in a variety of colors, which is nice, but the colored image is also blotchy like the Sharpie Stylo Pens. Unlike the Sharpie Stylos, I felt that I could not go back over the colored image and fill in the lighter areas. When I tried to, the paper under the pen felt a bit gummy and as if it might tear (although it did not). 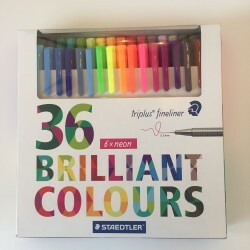 If you were coloring a design with extremely small areas, then the Stabilo Fineliners might work well for that, but I would limit their use to those instances. 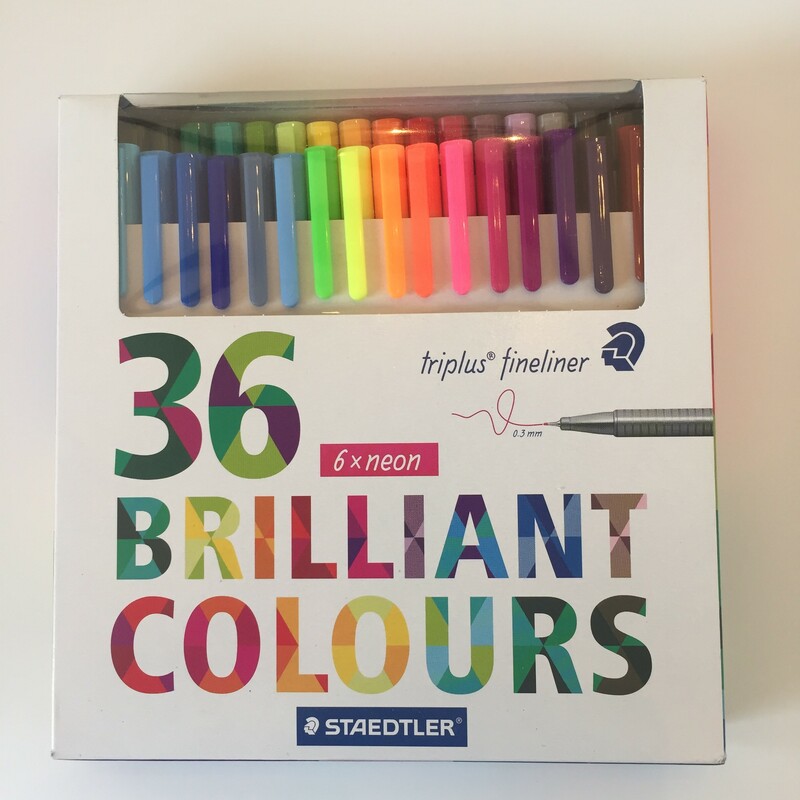 Staedtler Fineliners with 0.3 mm points are available in a 36 count package with an even larger variety of colors. 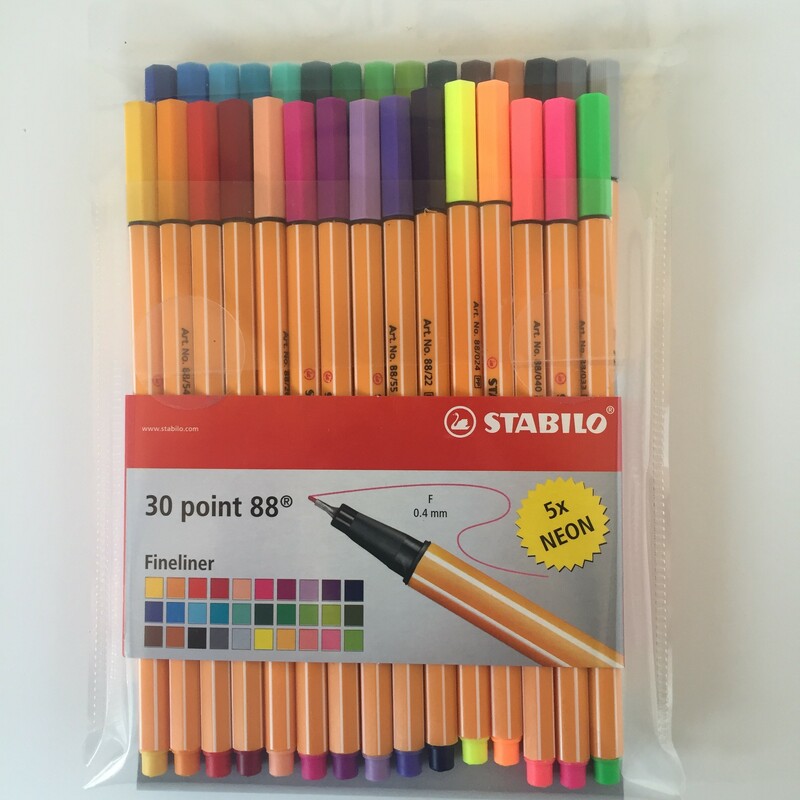 The 36 count package includes six neon colors. Oddly enough, like the Sharpie Stylo Pens and the Stabilo Fineliners, using the Staedlter pens also resulted in blotchy coloring. Going over the colored image to cover lighter spots also resulted in a gummy feel on the page. Overall, I was disappointed in all three of these products. 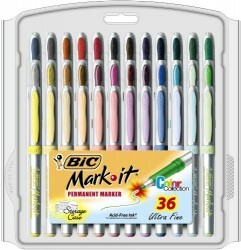 Bic MarkIt Ultra Fine markers are available in 36 pretty colors (including some lovely pastels). 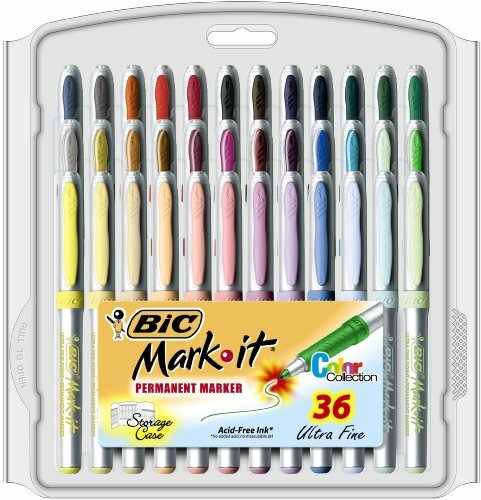 The points on these markers are not as small as the previous three markers, but if used with a steady hand, you can easily color very small and intricate designs. The colors are strong and the coverage is excellent. There is no need to go back over light areas because the color spreads so nicely, but if you did miss a spot, you can easily color over the image with no blotchy results. These pens are also almost odor free, a nice bonus. 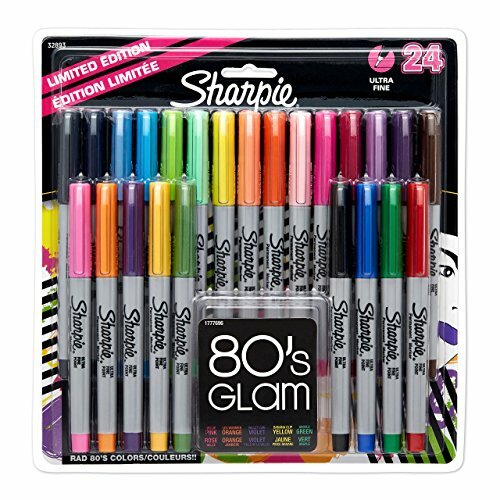 Sharpie Ultra Fine markers are available in a huge assortment of colors. So many, in fact, that I’ve lost count. Unfortunately, Sharpie often has “Limited Editions” with special colors that are, as the name implies, available for a limited time. 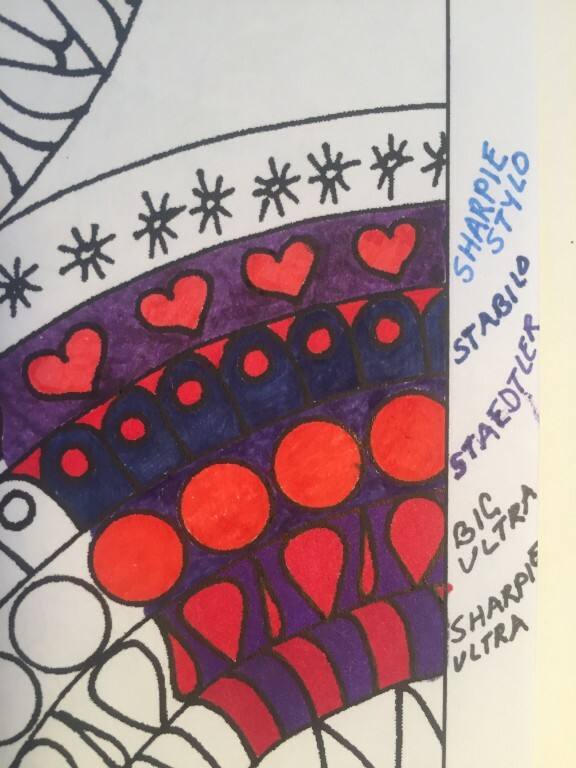 Here is a link to a nice package of 24 Sharpies that includes five of the new Color Burst colors (see my review of the Color Burst markers here). Personally, I’d like to see Sharpie make all of their colors available all of the time. 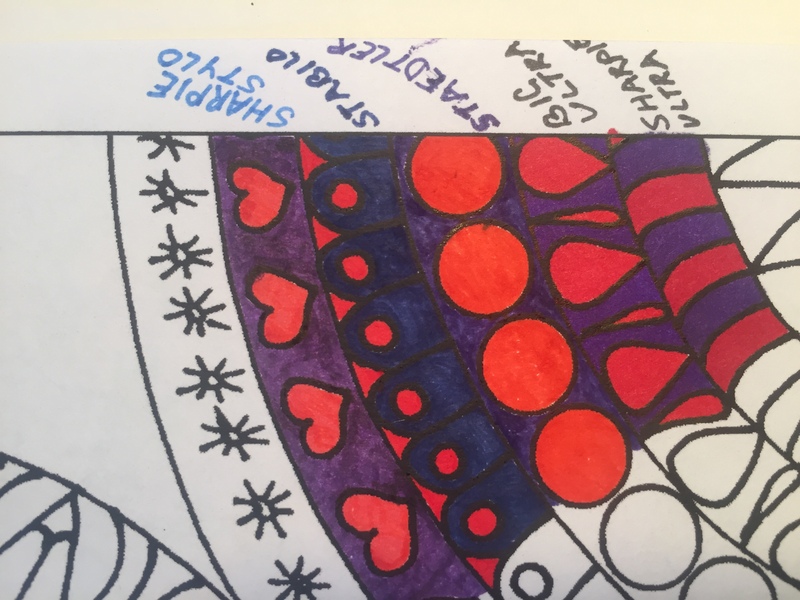 Like the Bics, the Sharpie Ultra Fines have beautiful strong colors that have excellent coverage. There is no gummy feel under the tip of the marker if you go back over a spot. The only negative I can find about the Sharpie pens is they do have some odor. Personally, I can overlook the odor for their excellent results. The Sharpie Stylo package boasts that these pens will not bleed through and I found that to be true. Of the five markers I compared for this review, only the Sharpie Stylo Pens had no bleed through. The Staedtler and Stabilo pens had minimal bleed through. The Bic Ultra Fine and Sharpie Ultra Fine markers totally bled through the paper and require that scrap piece of paper. 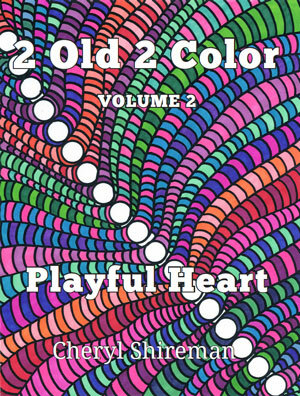 The latter would not work at all on coloring books where the images are printed on both sides of the pages (for that reason, all 2 Old 2 Color Adult Coloring Books are printed only on one side of the page). I hope you find this review helpful. Be sure to check out all of our adult coloring book art supplies on our SHOP page and all of our reviews of art supplies, books, bags, and organizers on our REVIEW page. Thanks for stopping by. Happy coloring!